As usual, way behind in updates this week. For your reading pleasure, there are twenty new or revised scripts up over on the Unproduced Scripts page. There are some horror scripts and short scripts, but no short, horror scripts. It sounded funnier in my head. The featured unproduced screenplay this week is Jared Shipley’s White Picket Fence (98 pages in pdf format). A New York college student returns home to Utah after his alcoholic father dies in a house fire. He lives with his hard-hearted, Vietnam veteran grandfather in a small, rural town. While there, the two decide to rebuild a decaying picket fence in the backyard, a symbol of their decaying family, and the young man is thrust into an odyssey of self-discovery, forcing him to face his demons about his family, himself, and the true nature of love. 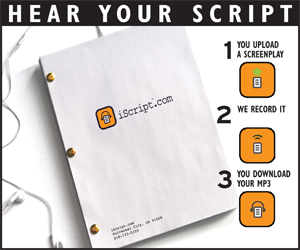 Over on the Unproduced Scripts page, there are 35 original scripts. I’ve been posting a few a day on the Discussion Boardfor the past week or so. As mentioned earlier, another script in the OWC was selected to have a feature length script they have written covered by the excellent Sandy Gunter of Whiskey Loose Tongue. Sandy has read for several major studios like Imagine, Buena Vista, New Line and Fox. In addition, he is a past reader for the Nicholl Fellowship and IFP. As you all know, in February we had the February One Week Challenge wherein participants were asked to write a 12 page dramatic script about a prison cell. We had 33 entries. The fine folks over at iScript.com were kind enough to select one script out of the group to be recorded. The selected script is Rydale’s Prison by Philip Whitcroft . An over crowded prison opens up a disused room with a dark history. You can read along with the pdf version of the script here. You can discuss this script and all the OWC entries here. Click the “Play” button to listen to the script. Very special thanks to iScript.com for sponsoring the challenge and judging the final scripts. The One Week Challenge never fails to spur folks to writing. This go around was no exception and within seconds of opening up the submission form, more original works came down the pipe. In an effort to serve the writers a little better, rather than put them up in chunks of 30 once a week (usually Sunday), I am trying to get at least one to five scripts up a day on the discussion board and then, at the end of the week call attention to them (as I am doing now) on the main site. So, with that being said, over on the Unproduced Scripts page we have twenty original scripts up for your reading pleasure. Greg’s script Addiction got picked up by a professor from Clarkson University in New York and it was filmed as a student project. You can view the work here.